Great degree. yup. those chemical engineers know their stuff. well, heck — I’ll let him tell his own dang story (via Keith Lawler)! While coaching youth soccer I was introduced to a beautiful friend of a soccer mom, who I married in 1989. Julia and I have three great kids (doesn’t everyone say this, even about their teenagers). Danny is 15, Lindsay is 14 and McKenna is 10. 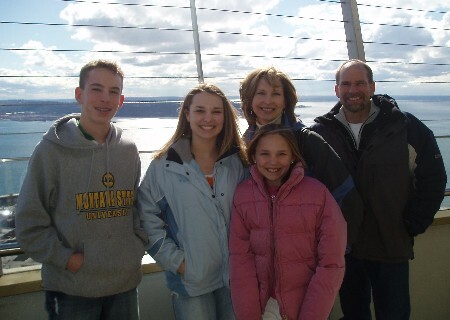 (Picture of us on the Space Needle this past month attached, something my oldest daughter always wanted to visit). Some of you may remember that Chevron took me to California. After 12 years I left to join an environmental services company running projects and the operation’s crew. We re-aligned it for sale and I took a position in engineering with a Moses Lake chemical company that refined silicon for computer chips. By 2001 they divested that site and I moved to their other site in Montana. The circle of work is unbroken as the Montana site was bought out by a Norwegian firm (Renewable Energy Corporation) this last summer, the same company that had bought the Moses Lake site. They refine silicon for photovoltaic energy cells. They kept me on in my role as Director of Technology and Quality, and now we’re headed back to Moses Lake. Looking forward to hearing from everyone else, and seeing you all soon. This entry was posted on Thursday, July 13th, 2006 at 10:58 pm	and is filed under Where_are_they_now. You can follow any responses to this entry through the RSS 2.0 feed. You can leave a response, or trackback from your own site.